How Did You Hear About Us? Web Search	Facebook	Twitter	Instagram	Pinterest	Email	Friend/Co-Worker	Networking	Katy Trail Collections	Other	 How Did You Hear About Us? Please allow us 24 business hours to respond to your request. Thank you! Bon Bon style stands on a flat bottom with the stick coming out the top. You can choose from our Basic, Specialty ($), and Spiked ($$) flavor options. Specialty flavors will include a $5 up-charge. Spiked flavors will include an $8 up-charge. Please note, Spiked flavors do include alcohol. A party with a Valid State ID or Passport showing proof of age must be available to receive your order, either for delivery or pick-up. 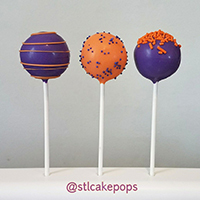 Please review our full Cake Pop Flavors menu for additional information about the flavors. If you have any questions, please call our store at 636-328-3922 so we can assist you with your order. 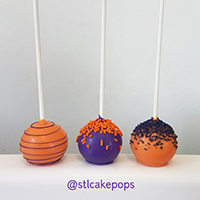 We typically sell our Cake Pops in sets as identified in the quantity options provided either on the product pages or as options provided in the form on the left. For orders under 6 count, store pick-up is the only option offered. We can also do custom designs! You can use the form option to upload a picture of what you would like us to create we will get back to you with a personalized quote. We typically suggest allowing us 5 business days to prepare your order. Occasionally we can handle Rush orders, but it depends on our current orders and production schedule. (Note, additional rates may apply to Rush orders.) Please submit the date you would like to have your order and we will confirm our ability to accommodate you in our reply to your request. Shipping: We ship ONLY via next day express service with USPS. This will help ensure that your items arrive in the best condition possible. During warm weather, we use dry ice to prevent the chocolate from melting. (Extra costs for warm weather shipping products will apply). Check out our FAQ page for answers to common questions. You can also call us anytime at 636-328-3922 and we will do our best to assist you.